I love pesto sauce. I have a basil plant at my house every summer.....basil is just one of my favorite herbs. I also love the store-bought pesto sauce. We keep a jar of the Costco pesto sauce in our fridge. We are constantly putting it on thin pizzas, different types of grilled cheese, pasta or just serve it in a bowl with a sliced baguette. I made this yummy summer salad last night. I decided this is one of those recipes that you can put just about whatever in it. 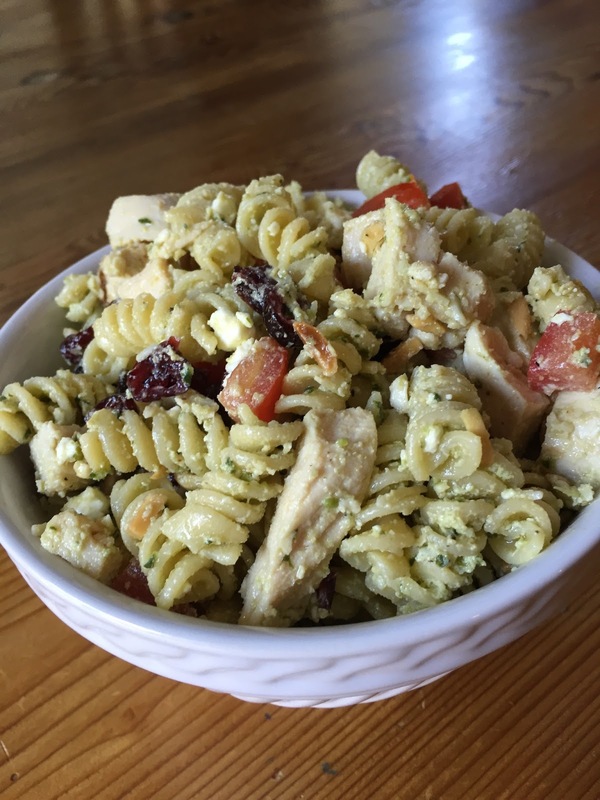 Consider avocado, artichoke hearts, sun-dried tomatoes, toasted walnuts, pine nuts or slivered almonds (I used toasted slivered almonds because that is what I had) Craisins, cherry tomatoes, green onions, feta cheese, Parmesan cheese, etc. I just went with what I had in my house.... Craisins, cherry tomatoes, toasted slivered almonds, feta cheese and Parmesan cheese - we loved it. 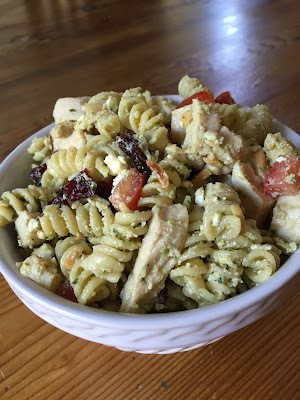 I did think the sauce soaked into the pasta as the night when on so you may have to reserve a little to add later or add a little more prepared pesto later. Toss over cooled pasta and add rest of ingredients. Chill and serve!